Enriched with a combination of Hyaluronic Acid and powerful vitamins, and with the application of the meso-roller by Laboratoires Surface-Paris, it delivers a shot of instant glow and boosts the complexion to reveal radiant skin. A powerful 5-week treatment, MESO-GLOW is the ultimate solution for intense hydration and stimulation of skin collagen. MESO-GLOW is a five-week skincare treatment that combines deep hydration with a collagen boost. Thanks to its ultra-light texture and the action of the Meso-roller’s micro-needles, the serum easily penetrates the epidermis to nourish it deeply. This light serum can be applied on the face, neck and décollete for an unprecedented result from the 1st application. 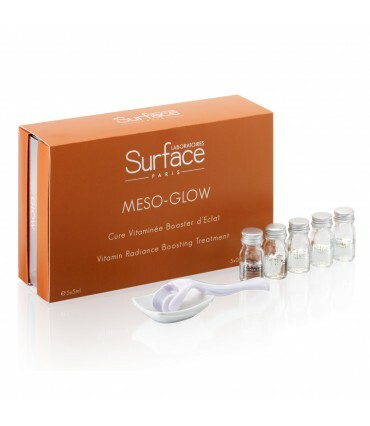 MESO-GLOW acts as a complexion booster and brings a deep and natural glow to the skin. For optimal use, apply to clean, dry skin, once per week for five weeks. Enriched in Vitamin C (3-O-Ethyl Ascorbic Acid), Antioxidants and Hyaluronic Acid, MESO-GLOW is a true vitamin blend that plumps the skin and stimulates subcutaneous micro-circulation to reveal an immediate glow. 3-O-Ethyl Ascorbic Acid is a derivative consisting of Vitamin C and an ethyl group that is proving to be stronger and more stable than ascorbic acid. It retains the benefits of Vitamin C as an antioxidant, and at the same time is extremely effective at improving the luster of the skin. This five-week treatment also contains antioxidants to protect the complexion by limiting the production of free radicals, and hyaluronic acid to densify and soften the skin. This form of hydrolyzed hyaluronic acid is obtained through the hydrolysis process of the hyaluronic acid, using plant-derived biotechnologies, and because of its low molecular weight, it is able to penetrate the epidermis skin layer more effectively, stimulating the synthesis of collagen and keeping the skin moisturized, compact and elastic. MESO-GLOW was developed to combat dull skin caused by pollution and an unhealthy lifestyle, restoring the complexion’s radiance and uncovering a youthful glow. Passé la 1er appréhension du Roller , l appli a est super simple et pas douloureuse .... j ai la peau très fragile . Great product didn't break me out. I decided to try this product after researching the ingredients comprehensively and reading reviews and articles. I have used the treatment 3 times, once every 7 days. I follow each treatment with a face mask and sleep with it. I found the rolling to be easy to use and it tingled the first time for about 2 minutes. I saw that this was completely normal. It actually gave me hope that it might actually be working! under my eyes were filled in. I smiled more that day! The second week I am sure that my cheeks had a dewiness I like to associate with youth. Now after 3 weeks I'm convinced it works. My pores are smaller and my skin is tighter. I have 2 more weeks to go and will finish my review then. But so far it works, really really well. I just finished my month long treatment and have only a positive review! I discovered this product from a review on a different website which gave it a high rating. I succumbed to purchasing online and found that for once it actually delivered the results promised. Expensive yes, but worth it with less fine lines, and a real glow that is visible today and I hope will last long. I will definitely use this product before my wedding in August so the I am the glowing best version of me on my big day! My best friend asked if I had been doing something different (I swear she was looking at me with a bit of suspicion like I had just done a major peel or injection without telling her haha). The best part is when I touch my skin it feels like baby skin. I liked the whole ritual aspect, one time per week for the five weeks. It felt okay the roller, and the serum absorbed fine into my skin. Thank you meso! La méso maison : top ! La présentation du produit est excellente, le roll-on, les flacons et la coupelle étant disposés dans un joli coffret. Passée cette première impression, on découvre un mode d'emploi simple et bien expliqué. L'application est facile, il suffit de faire des allers retours haut/bas gauche/droite sur le visage propre et sec avec le roll-on au préalable trempé dans le produit. J'avais un peu peur à l'idée de me passer 540 aiguilles sur le visage, mais en fait on ne sent rien, j'ai même trouvé l'application agréable, c'est un moment sympa où on s'occupe de soi ! Ce n'est qu'après l'application qu'on ressent des picotements, signe que le produit pénètre bien. J'ai ressenti également une sensation de tiraillement évoquée dans le mode d'emploi, facilement atténuée par l'application d'une crème hydratante. Mais c'est par les résultats que la cure MESO GLOW m'a le plus convaincue : dès la première application, l'effet bonne mine a été visible, même en hiver, et au bout de 3 applications, mes premières rides étaient visiblement estompées. Connaissant une amie qui a fait de la mésothérapie en institut, je trouve que cette cure est une bien meilleure option, car elle est moins couteuse et surtout évite des inconvénients difficiles à assumer (bleus très intenses). C'est donc un produit que je recommanderais sans problème et me rachèterai sûrement dans les années à venir. I've been using the treatment for 3 weeks now and can honestly say that it has helped hydrate my skin. It was easy enough to use and I followed the directions included. I also have received several compliments on my 'glow' so I am happy!